If he never completes another pass in his college career, quarterback Chase Brice already has a place in Clemson football history. As a redshirt freshman, Brice was suddenly forced into action after the transfer of Kelly Bryant and an injury to Trevor Lawrence in the Tigers' showdown with Syracuse last September. Brice, facing an opponent who beat Clemson the year prior and would go on to win ten games, was squarely in the spotlight in the afternoon's final moments. With the Tigers trailing 23-20 and facing a deciding 4th-and-6, Brice connected with Tee Higgins for 20 yards to move Clemson into field goal range. Brice ran for 17 yards on the very next play. Travis Etienne scored the game-winning touchdown four snaps later. A former high school baseball player, Brice got the win and, big picture, got the save. The Tigers, of course, would ultimately go on to win the College Football Playoff, becoming the first FBS team ever to go 15-0. Lawrence, an unprecedented true freshman sensation, completed over 65% of his passes with 30 touchdown passes and just four interceptions in leading Clemson to its third-ever national championship. While Lawrence established himself as a true national superstar, with countless memorable moments along the way, Brice has a legacy all his own. Brice, in Saturday's spring scrimmage, was quick to show his worth. 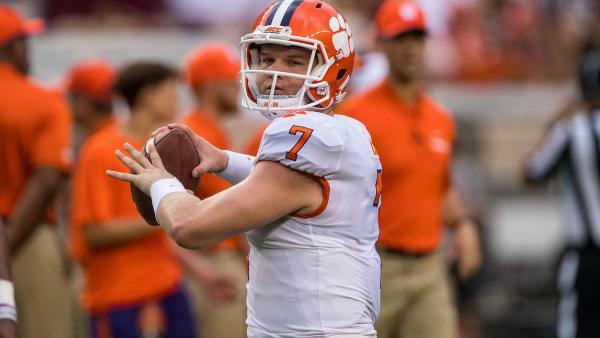 The Tigers' top reserve, Brice completed 10-of-19 passes for 165 yards and one touchdown in pacing Clemson's white team to a 30-10 victory over the orange. Fittingly, for Brice, he was named as one of the recipients of the Renwick-Flanders Most Improved Football Player Award. With the rest of his teammates, Brice was also presented with his national championship ring, a prize he very much helped the Tigers earn. Modern results suggest that having a capable back-up isn't just a luxury anymore, but a prerequisite, instead. In recent years, a number of title-winning teams have benefited from the poise and play of a second quarterback, Brice included. Whether Tua Tagovailoa coming in to outduel fellow former-reserve Jake Fromm to come through with the most iconic throw in championship game history or J.T. Barrett, and then Cardale Jones, stepping in for Braxton Miller in Ohio State's magical run, the role of a top reserve has become increasingly more prominent. Clemson's Orange Bowl foe in the semifinal last season, Notre Dame, saw Ian Book take over for Brandon Wimbush early in the year. What Brice gives the Tigers, in addition to a perfect throw on a critical 4th down in one of the most important games of the year, is security. The iconic Lawrence may already be the premier quarterback in all of college football; Brice, however, is much more than just his shadow. Brice, if need be, is capable of taking over under center at Clemson and keeping the same expectations intact. He has the trust of his teammates and the confidence of his coaches alike. Talented and still improving, Brice, most of all, is a winner. He took Grayson High School to a Georgia 7-A state championship in 2016, throwing for 30 touchdowns compared to just three interceptions that fall. Over the last five years of his career, playing for the Tigers and the Rams as a prep, Brice's teams have gone a combined 63-6 with four consecutive trips to at least the final four -- and counting. Not yet even an upperclassman at Clemson, Brice is running out of room on the mantle. Though Brice likely won't be talked about much this off-season, his role is a significant one. Brice has made the most of his opportunities to date. The famous Syracuse throw included, Brice completed 32-of-51 passes for 442 yards with five touchdowns and three interceptions as a redshirt freshman. While Lawrence trails only Tagovailoa, Fromm and Iowa State's Brock Purdy amongst returning Power Five starters with a passer rating of 157.56, Brice, a year ago, had a final figure of 156.14. It goes without saying that Clemson has one of the best players in the entire country in Lawrence, a talent fresh off a season college football simply has never before seen. In Brice, the defending national champions have a really good second-teamer, too. Fit with a play to remember and, now, some spring game momentum, Brice's stature continues to grow.